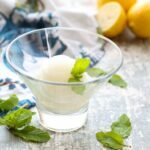 Fresh lemon sorbet topped with a splash of vodka is a light and refreshing treat that is a terrific addition to any meal. My sister and I often talk about that “unforgettable bite.” A special meal or fancy dinner out that you remember fondly often contains a certain food or combination of flavors that simply wows you. Our Chef’s Table experience with Princess Cruises was memorable from start to finish, but the lemon sorbet topped with vodka (served simply as a palate cleanser) was unforgettable. When planning a Princess cruise, I can not speak highly enough of the Chef’s Table experience. My sister Jenny and I were guests of Princess Cruises for our trip through the Western Caribbean. 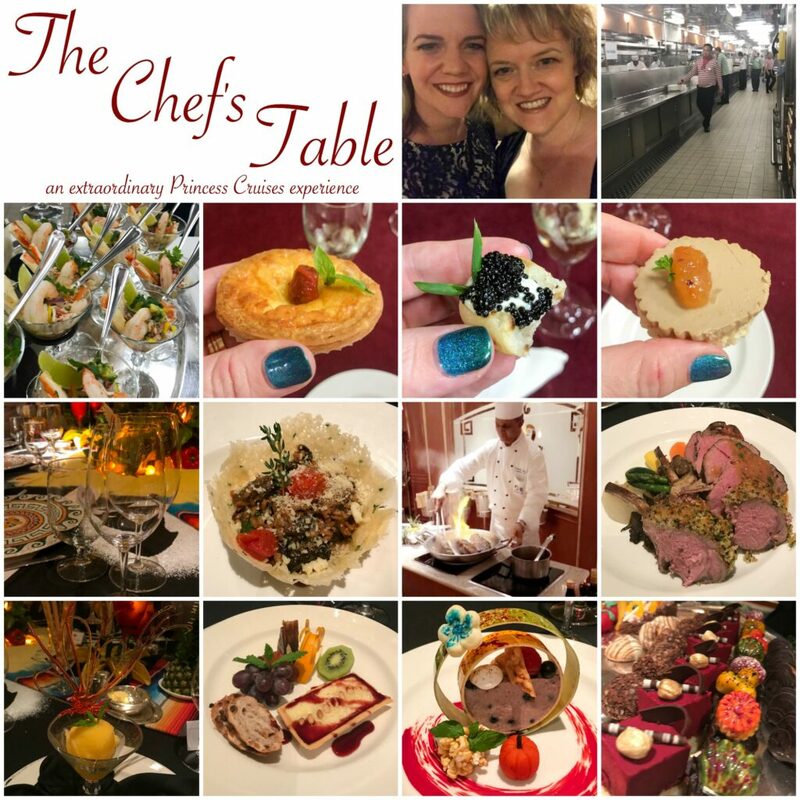 We celebrated Jenny’s birthday on the night of our Chef’s Table dinner, and as it turns out, a Princess Cruise is one heck of an amazing way to celebrate a special occasion. This has officially gone down in history as the best birthday dinner ever. The Chef’s Table has a very limited seating, typically only 10 people per cruise are able to be accommodated, and you’ll want to sign up the very moment you board the ship and then cross your fingers that you will be invited to the event. If this is important to you (and if you’re anything like me, it will be!) I’d recommend that you try to be one of the very first people to board the ship. The cost for the Chef’s Table is a fraction of what a similar experience would cost on land at a high-end restaurant. I don’t use the word experience lightly. This dinner is truly an extraordinary experience. The meal had so many courses, I lost count. I cannot recommend the Chef’s Table highly enough. If you’re fortunate enough to get your name on the list and then be invited to join the Chef’s Table, the most important thing to remember is to come hungry! (and pace yourself, seriously, do try to pace yourself) Every bite is fantastic and you’ll be full before you actually sit down at the table if you even eat all of the appetizer bites you’re given. While I typically choose a rich ice cream or a chewy fudge brownie for dessert, believe it or not, there are times when I crave something lighter. Whether you’re serving this as a palate cleanser, a light dessert, or a fancy after dinner treat, I’m willing to bet that you’re going to love it every bit as much as we do. Kitchen Tip: I use this ice cream compressor (or this ice cream maker) to make this recipe. In a large jar, shake together the sugar and the water until the sugar has dissolved. Add the lemon juice and vodka. Stir to combine. Pour into your ice cream maker and process until slushy and almost scoop-able. Transfer to an airtight container and place in the freezer until ready to serve. 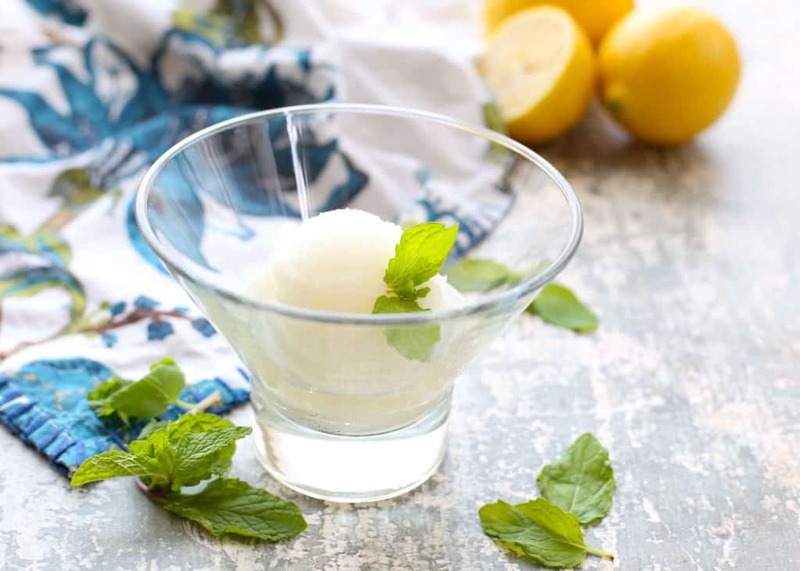 To serve: Place one scoop in a small glass or bowl and pour 1 ounce of vodka over the sorbet. Garnish with mint. Enjoy! If you don't have an ice cream maker, pour the mixture into a shallow pan and freeze until almost firm. Remove from the freezer and fluff with a fork. Return to the freezer until firm. Scoop the frozen mixture into a blender or food processor and process just until smooth. Transfer to an airtight container and freeze until ready to serve. I highly suggest using a premium vodka for this recipe. 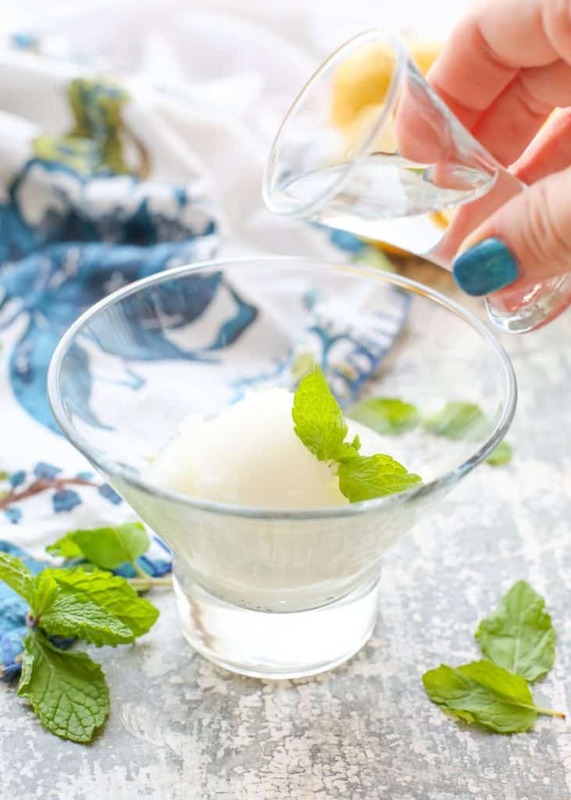 I typically use Titos or Grey Goose to make this sorbet. For a peek into the rest of our Caribbean cruise, check out The Best Small Gifts For Travelers and What To Do In Cozumel, Mexico. Now is a great time to visit the Caribbean as 90% of Caribbean ports are fully open for business – including restaurants, shops, beaches, and activities. For perspective, the Caribbean is an extraordinarily immense region that stretches for over one million square miles. As a result, the vast majority of the islands were not in the paths of the August and September hurricanes. Most of the region’s ports incurred minimal or no damage and continue to be in operation. 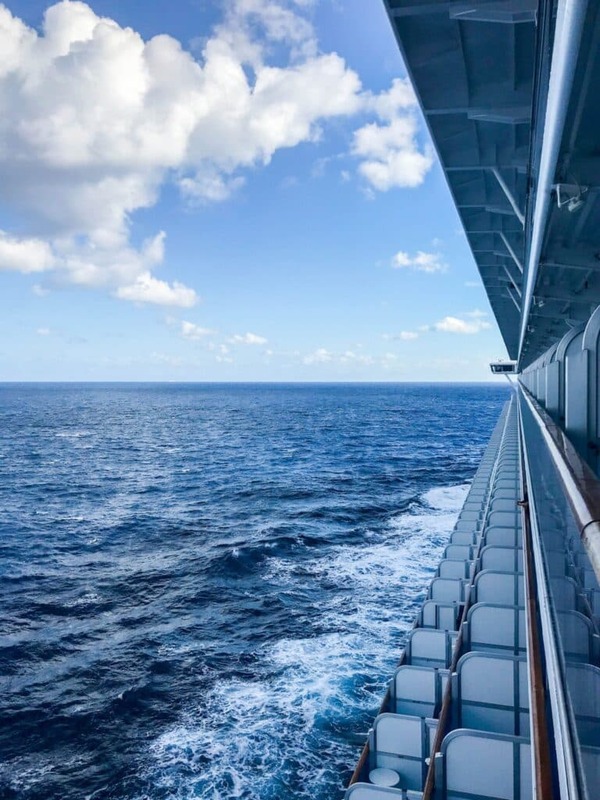 Princess Cruises and its parent company Carnival Corporation are working to provide extensive relief to those affected by Hurricane Harvey, Hurricane Irma, and Hurricane Maria as part of Carnival Corporation’s pledge to provide up to $10 million dollars in hurricane relief. Disclosure: I’ve partnered with Princess Cruises to share my travels with you. As always, all thoughts and opinions are my own. For more information about Princess Cruises and/or to book a cruise visit their website at www.princess.com. I'll definitely remember to come hungry to the Chef's table. Thanks for sharing your recipe. Why wouldn’t you make a simple sugar to eliminate the graininess of the sugar it would be much smoother. All you have to do is boil the sugar and water for 10 minutes to dissolve the sugar. More water can be added to replace after condensation. Hi Eliza, I've actually tried both methods and found that there was no graininess whatsoever when the recipe was made as written here. As a result, I've eliminated that step when I make this sorbet. Both results were delicious!